Quadratic functions are polynomials in which the largest exponent is 2. 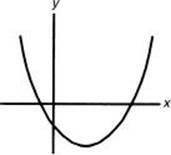 The graph is always a parabola. The general form of the equation is y = ax2 + bx + c. If a > 0, the parabola opens up and has a minimum value. If a < 0, the parabola opens down and has a maximum value. 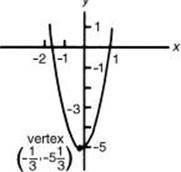 The x-coordinate of the vertex of the parabola is equal to , and the axis of symmetry is the vertical line whose equation is . To find the minimum (or maximum) value of the function, substitute for x to determine y. Thus, in general the coordinates of the vertex are and the minimum (or maximum) value of the function is . Unless specifically limited, the domain of a quadratic function is all real numbers, and the range is all values of y greater than or equal to the minimum value (or all values of y less than or equal to the maximum value) of the function. The examples below provide algebraic underpinnings of how the orientation, vertex, axis of symmetry, and zeros are determined. You can, of course, use a graphing calculator to sketch a parabola and find its vertex and x-intercepts. 1. Determine the coordinates of the vertex and the equation of the axis of symmetry of y = 3x2 + 2x – 5. Does the quadratic function have a minimum or maximum value? If so, what is it? The vertex is, therefore, at . The function has a minimum value because a = 3 > 0. The minimum value is . The graph of y = 3x2 + 2x – 5 is shown below. 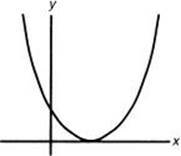 The points where the graph crosses the x-axis are called the zeros of the function and occur when y = 0. To find the zeros of y = 3x2 + 2x – 5, solve the quadratic equation 3x2 + 2x – 5 = 0. By factoring, 3x2 + 2x – 5 = (3x + 5)(x – 1) = 0. Thus, 3x + 5 = 0 or x – 1 = 0, which leads to or 1. Every quadratic equation can be changed into the form ax2 + bx + c = 0 (if it is not already in that form), which can be solved by completing the square. The solutions are , the general quadratic formula. Substitute a = 3, b = 2, and c = –5 to get the same zeros, or x = 1. Most numerical answer choices on the Math Level 2 test are in the form of numerical approximations. Simplified radical answer choices are rarely given. 2. Find the zeros of y = 2x2 + 3x – 4. Solve the equation 2x2 + 3x – 4 = 0. The left side does not factor. Using the quadratic formula with a = 2, b = 3, and c = – 4, gives x 0.85078 or –2.35078. These solutions are most readily obtained by using the polynomial solver on your graphing calculator. Note that the sum of the two zeros, equals , and their product equals . This information can be used to check whether the correct zeros have been found. In Example 2, the sum and product of the zeros can be determined by inspection from the equations. and Product . The sum of the zeros is and the product of the zeros is . At times it is necessary to determine only the nature of the roots of a quadratic equation, not the roots themselves. Because b2 – 4ac of the general quadratic formula is under the radical, its sign determines whether the roots are real or imaginary. The quantity b2 – 4ac is called thediscriminant of a quadratic equation. (i) If b2 – 4ac = 0, the two roots are the same , and the graph of the function is tangent to the x-axis. (ii) If b2 – 4ac < 0, there is a negative number under the radical, which gives two complex numbers (of the form p + qi and p – qi, where ) as roots, and the graph of the function does not intersect the x-axis. 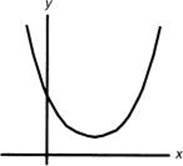 If the zeros are complex, the parabola does not cross the x-axis. (iii) If b2 – 4ac > 0, there is a positive number under the radical, which gives two different real roots, and the graph of the function intersects the x-axis at two points. 4. Find the zeros of y = 2x2 + x – 6.